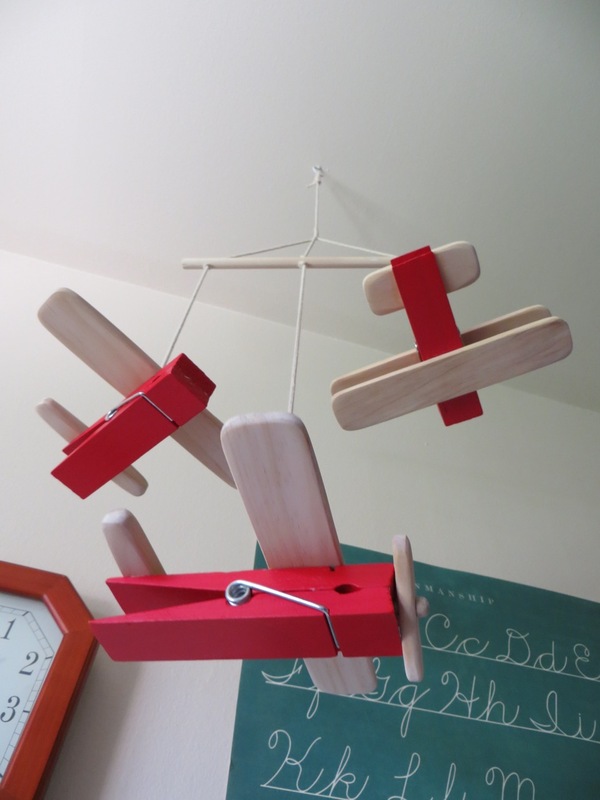 Of course you could just make the airplanes and set them on a shelf for decoration or have them be toys! 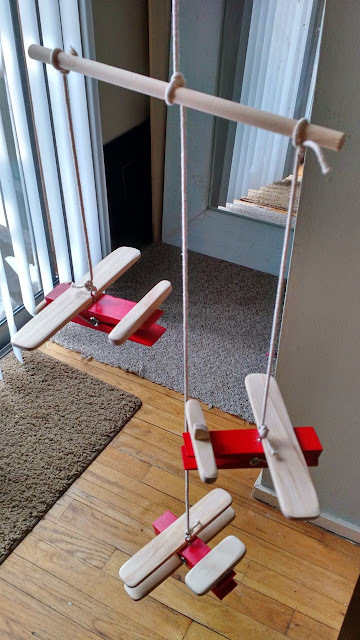 *If you don’t want to make your airplanes into a mobile, you do not need to have the items with the (*). 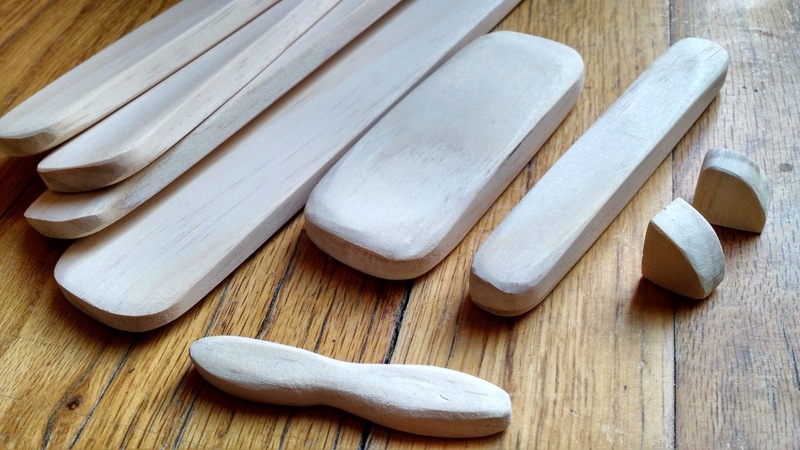 First step is turning your pine craft boards into the wings, tailpieces and propeller! 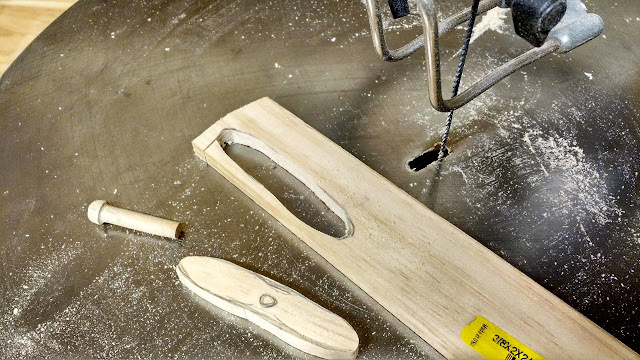 Your boards are 2″ wide and you’ll want to cut 4 8″-long pieces for the wings and 2 4-1/2″-long pieces for the tail pieces. On one of the tail pieces, cut it down the center to make 2 narrow pieces (only one shown in picture). Cut 2 triangles with a curved top side that matches the width of your narrow tail pieces. Sand all edges smooth and round corners. Follow instructions below for the propeller. For the propeller, sketch out a long-narrow oval that is about 2-3/4″-long and 1/2″-wide on your craft board. 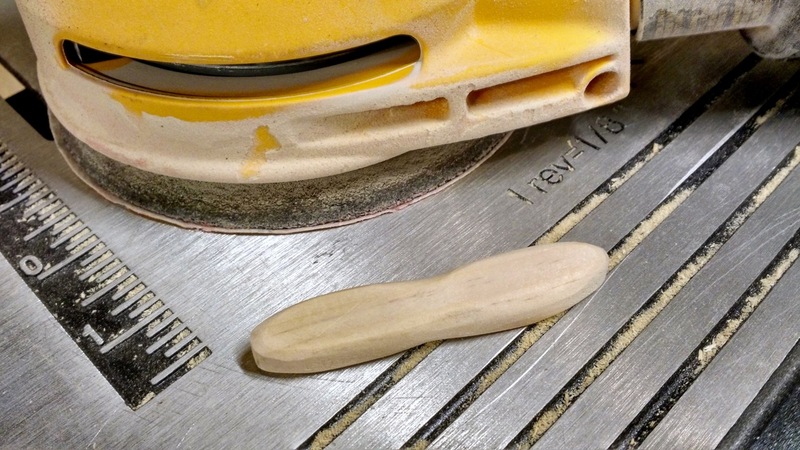 Cut out with your scroll saw or band saw (or made due with a jigsaw or handsaw). 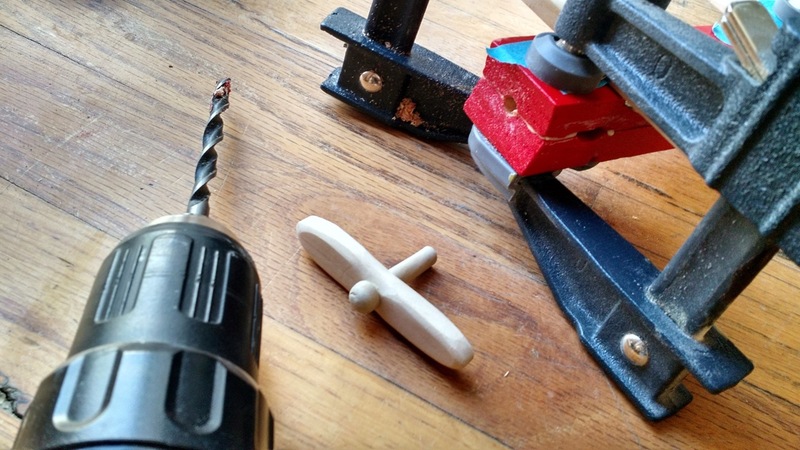 Shape your propeller, especially the indent in the center, with a sander or use regular sandpaper by hand. TIP: You want to keep the width in the center for strength.. just create the illusion of narrowness by creating the indent. 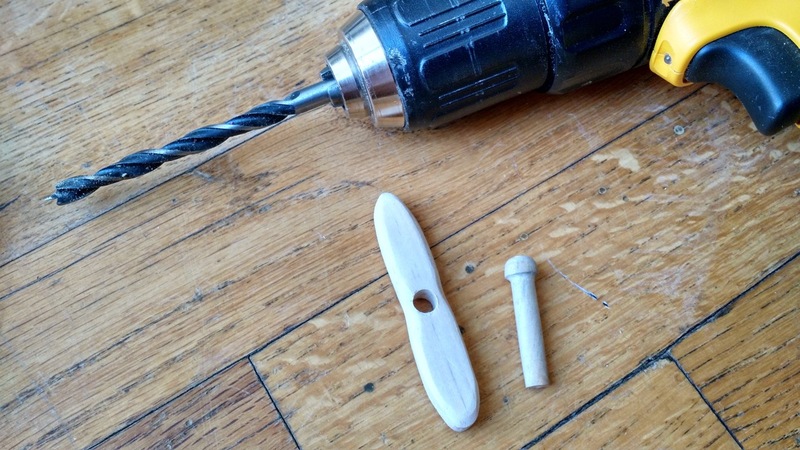 Drill a hole SLIGHTLY larger than your peg axle in the center of your propeller. 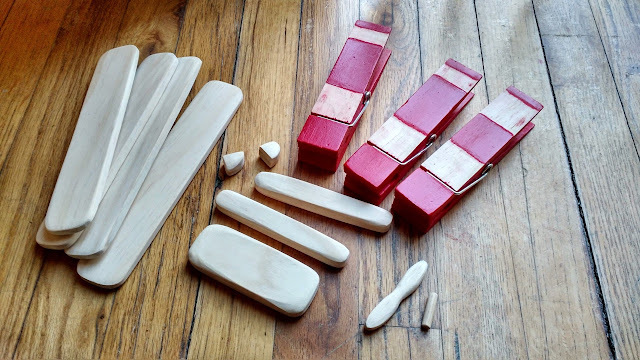 My clothespins were painted so I sanded off the paint in the areas where I wanted to glue my pieces… do the same if you wish. 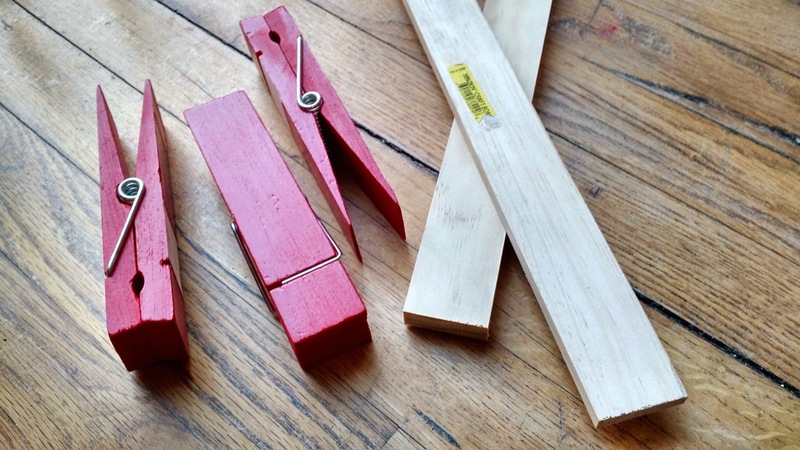 I wanted to keep my clothespins closed so I glued inside. 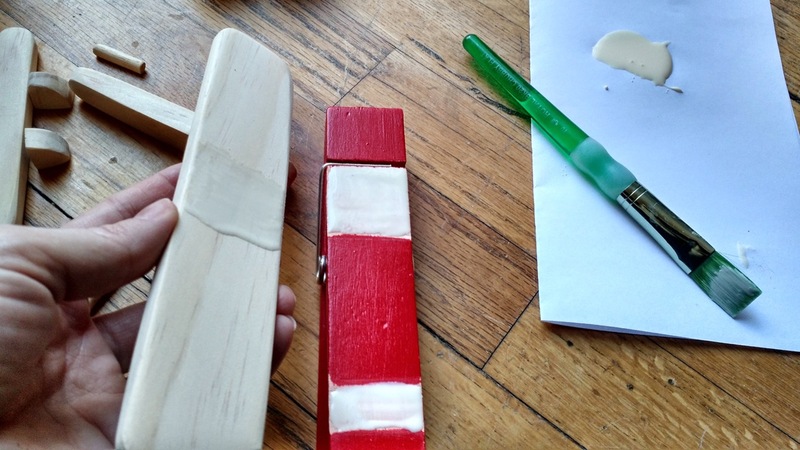 You can wrap masking tape around the outside to make sure it dries tight and both pieces are centered. For your propeller, drill a hole in the front of one of the clothespins. Butter axle and inside of hole with glue and push propeller in. 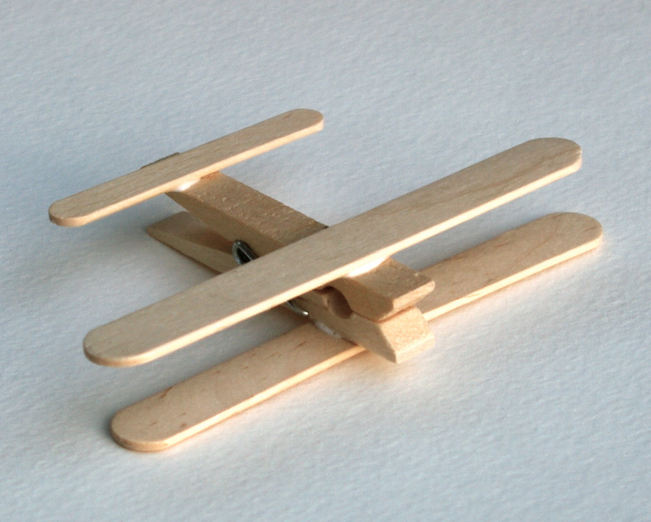 Now you can start assembling your airplanes! 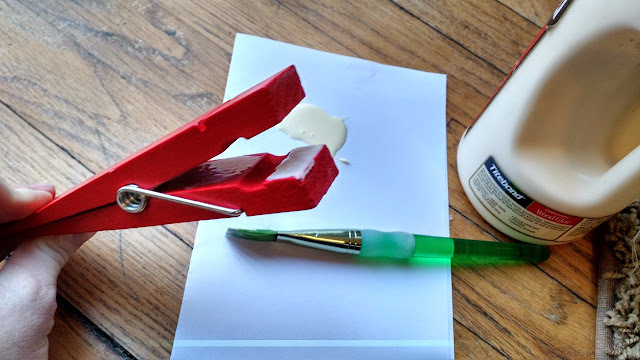 Make sure to butter up each area with glue that will be touching each other. 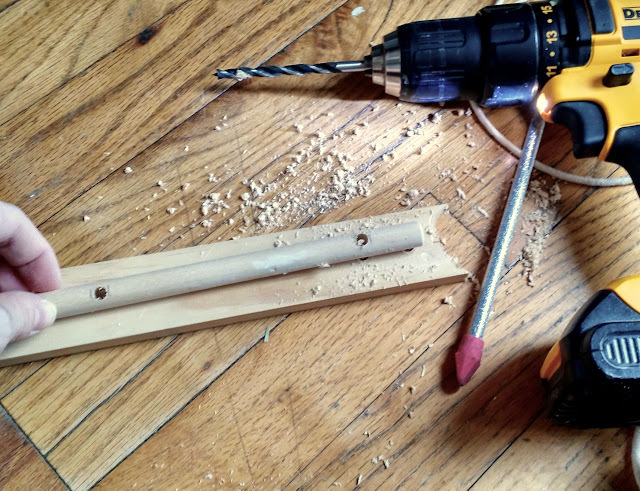 Use masking tape to hold pieces in place temporarily while you clamp. 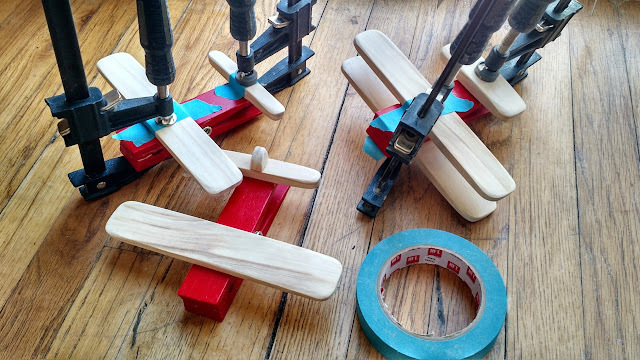 If you only have 2 clamps… do 1 airplane at a time. Once the glue is cured you can use masking tape to find the center of balance on your airplanes (so you know where to put your eye screws). The center of balance for me just happened to be behind the wings on all 3! Pre-drill a hole and twist the eye screws into place. 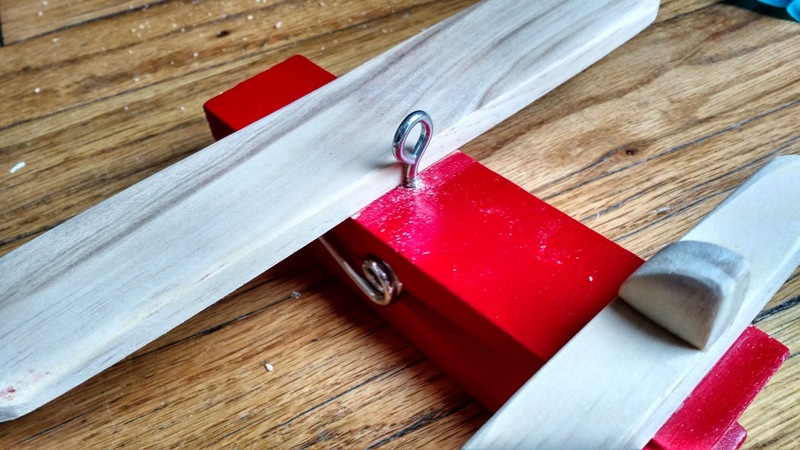 Now you can start figuring out how long you want your airplanes to hang down from the dowel. My smallest rope (left) was cut @ 15″, longest rope (center) was cut @ 38″ and medium rope (right) was cut @ 20″. 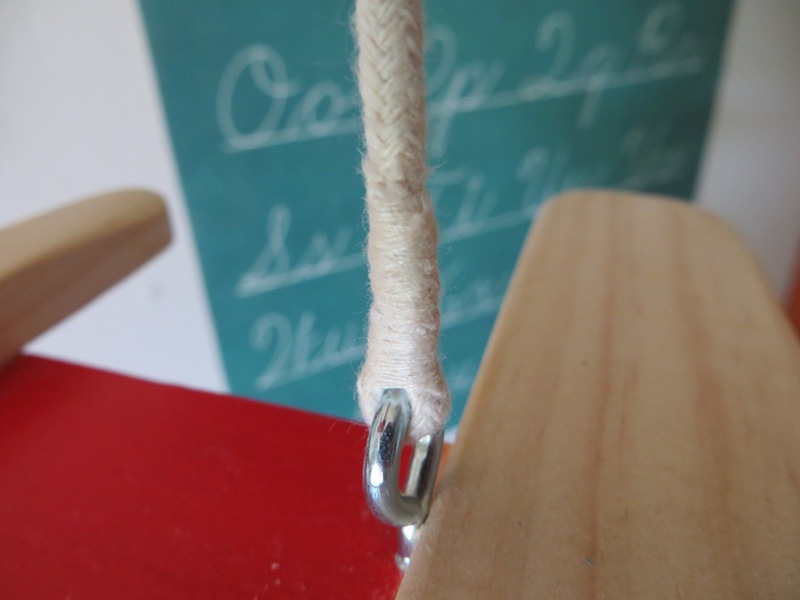 Tie a knot around each eye screw and then around the dowel (you’ll want there to be about 7″ extra on the top-end of each of the ropes on the sides-not pictured above). 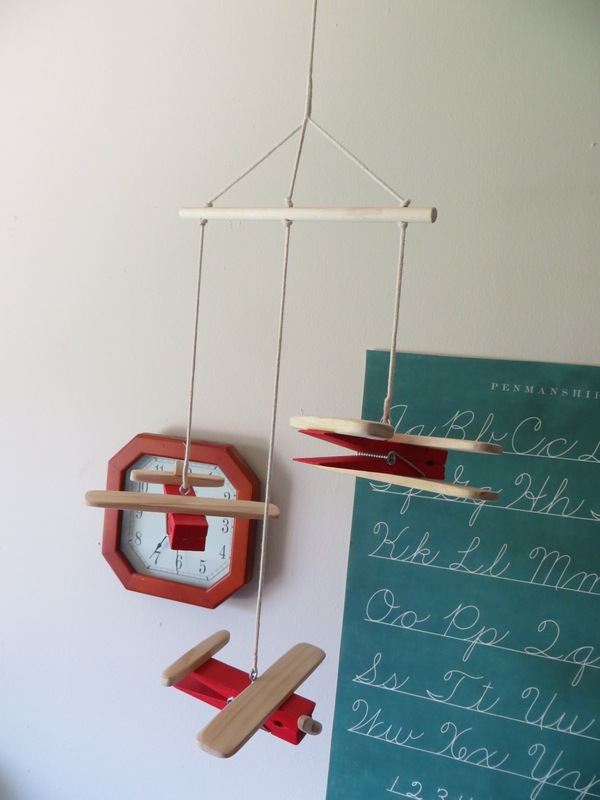 Mostly what you’re doing here is finding the balance between all the airplanes so the dowel hangs horizontal (because each airplane weighs differently). 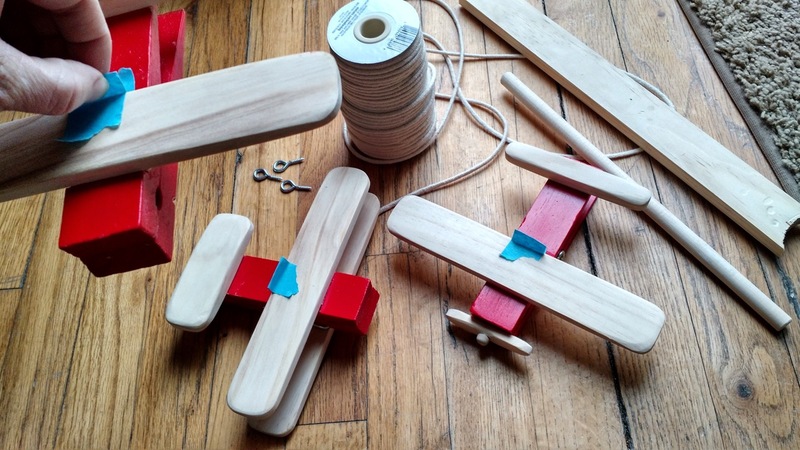 Once you find where the ropes need to be for the dowel to hang horizontal, mark the dowel along each side of where the ropes are tied and also make a note next to the marks about which airplane was hung there. 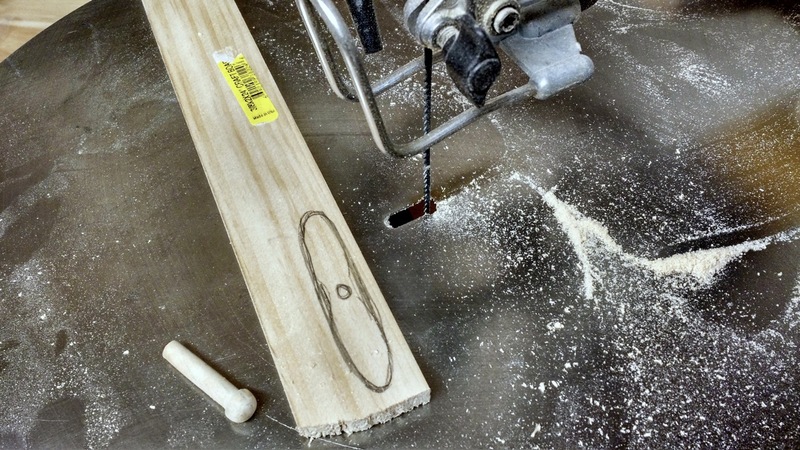 Drill a hole in the center of your marks, making sure they’re all centered together. I used a 1/4″ bit since my rope is 1/4″ thick. 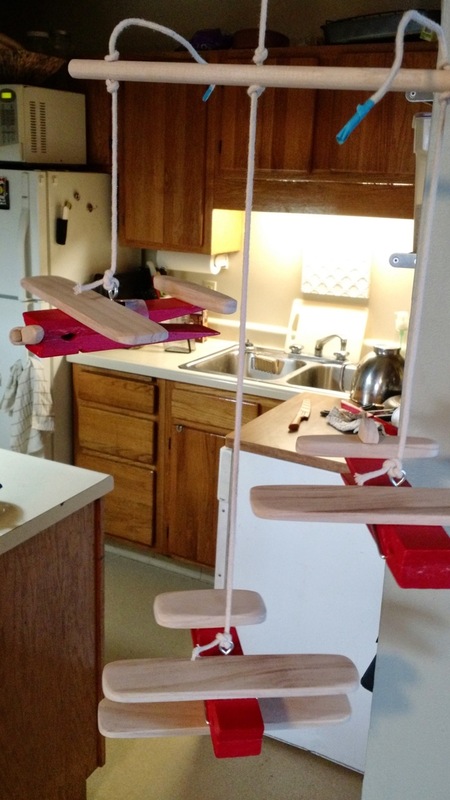 Here’s my mobile with ropes going through the holes in the dowel, knots tied on each side of the dowel and I have at least 7″ of extra rope on each of the end ropes. 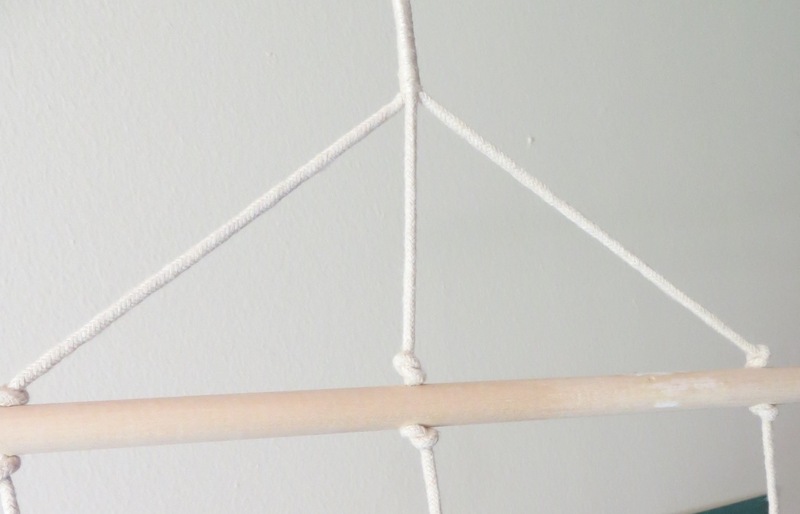 I overlapped the rope with itself about 3/4″ and wound thread over the overlapping area over and over until the end was completely secured down. For the top section I brought the free ends from the sides over to the center rope and wound thread around all 3 securing them tightly together (the ends overlapped about 1-1/2″ with the center). 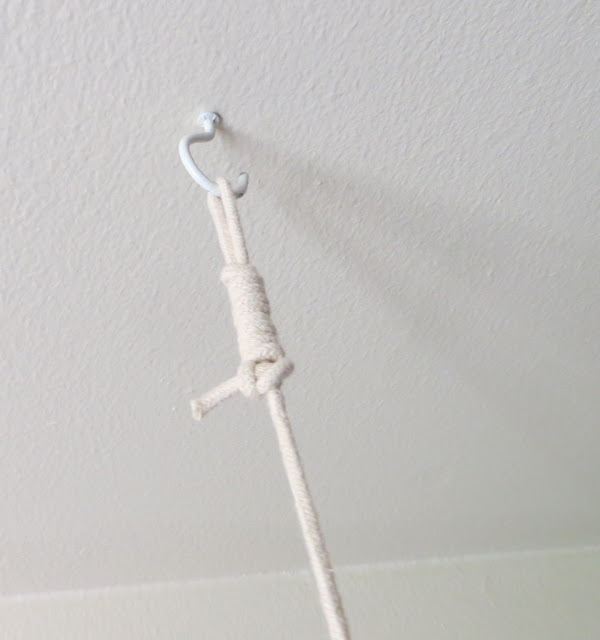 For the last touch, I made a loop on the end of the middle rope for hanging. I made it so I could easily undo and adjust the height of the mobile if needed later.